Due to increasing odds on heavy and severe weather this Saturday, April 6th, we’ve had to reschedule JUST ONE NIGHT for an alternative Saturday. While “comfort” was never the goal of sleeping in the park for a night, the safety of our participants IS. Thanks to the San Antonio Parks department and some quick rescheduling, we have set the rain date for JUST ONE NIGHT to: Saturday, May 18th. The hours will be the same, 6pm to 6am, with the family portion of the evening (chili/baked goods contest and park games for the kids) being from 6pm to 8pm. We hope you can still make it! Are you a business or individual that is interested in sponsoring Just One Night 2019? Please review the following document and reach out to us if there are any questions! Today we handed out the checks to Thrive Youth Center and Stand Up For Kids from our innagural year of “Just One Night”. We were very pleased to present both organizations with $1895 for their work on behalf of homeless youth in the San Antonio area. 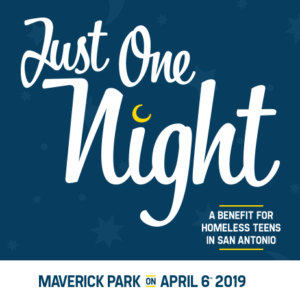 With a heart full of joy, I’d like to announce that Just One Night raised $3,700 in its inaugural year to benefit the organizations Thrive Youth Center and StandUp for Kids – San Antonio. The weather turned a bit colder than we like here in San Antonio, (48 degrees may as well be snow as far as we are concerned) but my registrants were real troopers and they did exactly what they said they would… they slept in the park for the night in the hopes that the kids these organizations help will have a better tomorrow on the horizon. During the night, I found myself musing on the fact that we, people who have homes, jobs, and security… were permitted to sleep in the park overnight with an officer to watch over us for protection. But the homeless youth we were working to help? They would have been chased out of the park and made to move on by the very same officers. The strange irony of that fact was not lost on me. I just got done sending out the thank you notes to all that donated. If I had your physical address, I sent an actual letter and you got a little something extra coming your way just to show my appreciation for your support in this first year. I couldn’t have done any of this without you. To all the supporters, near and far, thank you for helping to turn Just One Night into a reality. Ultimately, this is not a “one and done” for me. I care deeply about this topic because of my own personal history. So now that I’ve proven that it CAN be done, I need to set about proving that it can be GROWN. So a bit of a deep breath and moment to relax, and then onward and upward, my dears.